A no-holds barred insight into the military maelstrom of Viet Nam. The author presents a JAG (Judge Advocate General) lawyer who represents soldiers accused of murder and drug offenses. And the censors are not allowed to lessen the brutal telling of the pitfalls. This audio presentation brings the listener into the fray, allowing him to feel, taste, touch and react to military life in Viet Nam. Using the experiences of a non-career Army lawyer assigned during the last days of duty in Viet Nam, we discover that the justice served in the military is a fight in itself. At times that legal battle is influenced by high command input not necessarily beneficial to the lawyer’s role or to the meting out of justice to the defendant. The five CD’s of this moving presentation guide us through the daily experiences faced by the “grunts” which, of necessity, become the foundation of the ordeal of the defense counsel. Fortunately, where he finds innocence of the purported crime, our lawyer battles through the layers of military law to bring about a “not guilty” decision. This is a “must listen to” story of little known area of the conflict in Viet Nam. 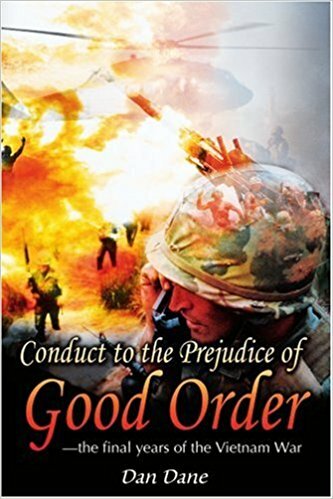 Conduct to the Prejudice of Good Order offers a glimpse of conditions around Bien Hoa during the last years of the war. Bill Blake encounters fragging, racism and heroin addiction while defending soldiers in court-martial trials as a young Army lawyer. Much like the soldiers he defends, Blake finds himself in conflict with his superior officers. The story of a drafted, civilian attorney serving as an Army lawyer in Vietnam gives this book a unique perspective. Captain Blake's experiences accentuate many of the troublesome aspects of the war, including the draft, authority of Commanding Generals, domestic demand for troop withdrawal and in the end, the delivery of heroin to the American troops. The historical fiction genre allows vets to recognize historically correct settings in Vietnam during 1971-1972 in this book. The fictitious characters and circumstances provide an entertaining read for those who lived through the era as well as those for whom Vietnam is only a curiosity out of the distant past. Other books by Dan Dane include Fireflies in the Delta and Bloodlines of Tyranny.